Mark Walters and the 1916 Bevo Heist. Mark Walters is a former strength and conditioning coach who was blessed to have worked for 3 years under Augie Garrido, and on the staff that won the 2005 College World Series. Mark, as member of the American College of Sports Medicine and the National Strength and Conditioning Association, contributed to the innovative team of coaches that led to the success that Longhorn student athletes had both on and off of the field. Having retired from strength and conditioning coaches, Mark now resides in Austin and works as a legal analyst. Strength training is not a modern invention. Egyptian tombs show pictures of lifting bags filled with sand and stone swinging and throwing exercises. These types of things were also popular in early Germany, Scotland, and Spain. Weightlifting competitions date back to the early Greek civilization. 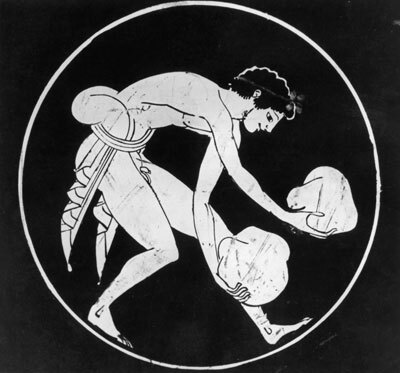 These events led to the origination of games that later became known as the modern Olympics. The pioneers of these events did not have the sophisticated equipment that we have today or the research on training and physiology to back up the exercises, but they did have the most important thing — the desire to lift something heavy for fun, sport, and physical health. Mother Nature’s gifts are all that these originators had to use. They made equipment out of whatever they could. As time went on, they created more modern inventions for weightlifting. For example, dumbbells originated in the 1700’s when a rod was placed between two church bells. When a clapper was removed from the bells, they became silent, or dumb, hence the word dumbbell. Indian clubs, which resemble a bowling pin and kettle balls (cast-iron balls with a handle), were popular in the early 1800’s. Weight-training equipment evolved in the form of pulleys, air pressure devices, and multi stations in the 19th century. At first, the people who used this type of equipment were strongmen performing at contests and exhibitions. Amateur weightlifting became a sanctioned event at the Olympics in 1896, although there were no female athletes. Women’s weightlifting didn’t become a sanctioned Olympic sport until 2000. The field of Strength & Conditioning in this country has evolved greatly over the last 30 years. The prescription of resistance exercise to improve strength and power has been commonplace in some countries for most of the past century, but it did not begin to rise to prominence in the US until the late 1970’s. The incorporation of strength training into sports was slow to evolve, but this movement was led primarily by a handful of college football programs, including Texas. Dating back to the 1920s and 30s Texas wrestling coach, Roy J. “Mac” McLean, was at the forefront of using strength training to prepare his athletes. In a 2006 journal paper, UT professor Terry Todd tells how football coach Clyde Littlefield (yes, he coached football too) was skeptical of a young walk-on athlete who never played a down of football in his life but was willing to give this athlete an opportunity at the urging of McLean. Ralph Hammond trained all summer which was unheard of in those days, incorporating weights—snatches and cleans and presses and curls, set after set into his training routine. This was highly unusual for football players at the time but in the fall, it paid off. According to McLean, Hammond made the first team after decimating the unconditioned football players that showed up in the fall. (search for Roy McLean to read more about his influence on the University of Texas. Arguably, the godfather of modern day strength training is Boyd Epley, who in 1969 was rehabbing injured athletes at Nebraska. Epley was hired in 1969 by the University of Nebraska to become the nation’s first fulltime strength coach. Tom Osborne, then a first-year offensive coordinator at Nebraska, noticed that injured players being rehabbed by Epley returned to the gridiron even better than before, so he wondered what kind of impact strength training would have on healthy players. "If you're looking for the most impactful change, in terms of progression, Nebraska's coaches coming onto the scene like that -- that was probably the single most important event," said Dr. Peter Weyand, an SMU professor of applied physiology and biomechanics, and one of the nation's foremost experts on human performance. Epley was the innovator of the 1 rep max. This one-repetition maximum (one rep maximum or 1RM) in weight training translates to the maximum amount of force that can be generated in one maximal contraction. In layman’s terms, the amount of weight that a person can move just 1 time. For most athletes, this is the gold standard to prove strength. The changes Epley instilled were incredible for the time. In 1970, according to Epley's records, the average Husker bench-pressed 206 pounds and no one could bench 300. By 1983, the average became 302. But it was the immediate impact that sent tremors through the college football world. In 1969, the Huskers rebounded with a 9-2 record and handed the Sooners what was then their worst loss in the series since 1928, 44-14. In 1970, running back Joe Orduna also bounced back from a knee surgery -- usually a career-ender -- to record career bests in yards (897), yards per carry (4.5) and touchdowns (15). As a side note, the two storied football programs of the Texas Longhorns and the Nebraska Cornhuskers have met only 14 times in history, with Texas winning 10 of those games. It’s the author’s belief that even though there is an equal recruitment of talent, the end results on the field came from the weight-room, which as discussed, originated in Lincoln. To imagine any athletic program not having an off-season strength and conditioning regiment is unheard of today, but the evolution of seeing its benefits took a long time to become apparent. It wasn’t until the early 1970s did strength conditioning programs really take off, and in today’s high dollar coaching carousel that we witness every December and January, it’s not uncommon to have a high paid conditioning coach accompany a new coach. Salaries for these coveted positions at such prestigious programs as Texas are upward of $500,000. It should be noted that when Epley was hired as Nebraska’s strength coach, he was paid $2 per hour working only three days per week. Strength training is evolving as we speak. From circuit training to multiple muscle workouts, functional core training is the cause of this evolution. Balance, stability, pure core strength, and functional training are vital for athletes to perform at their best and to also minimize injuries. 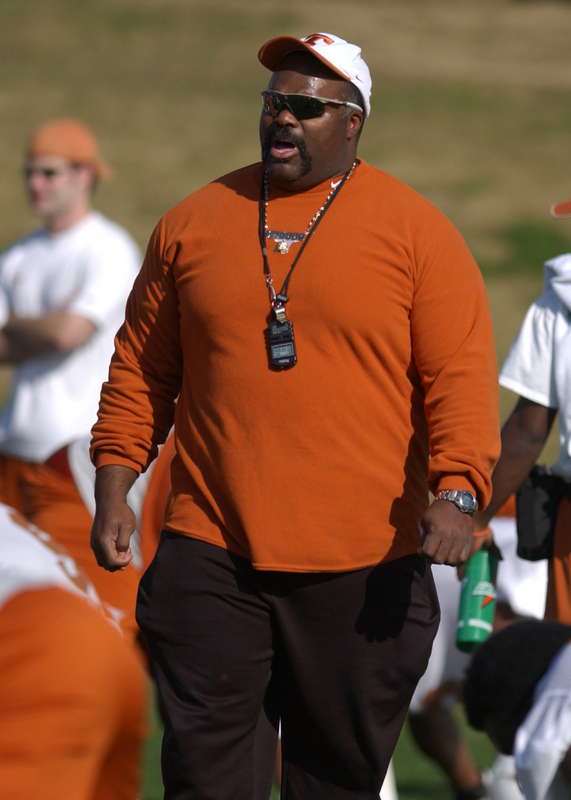 The University of Texas has had a recent string of very talented and educated strength coaches that have made tremendous impact on the teams that they have coached. Jeff “Mad Dog” Madden was highly touted when he accompanied Mack Brown from North Carolina. 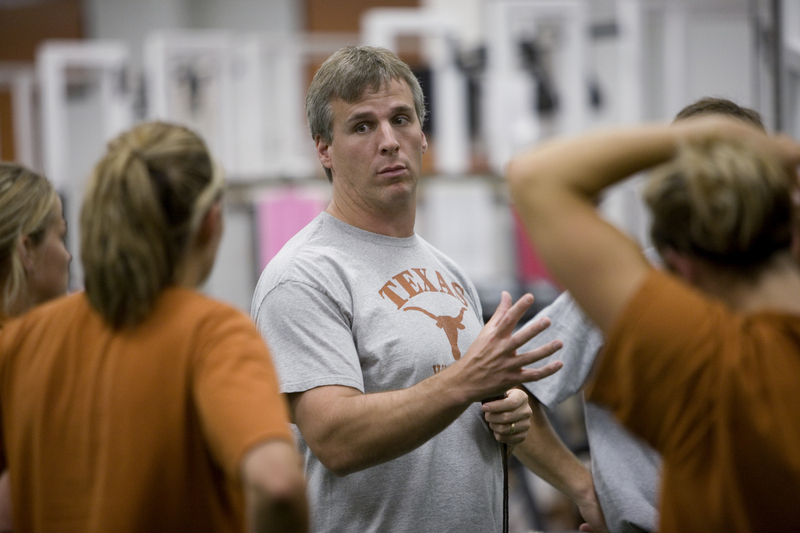 Todd Wright has lead the Texas basketball teams’ strength program since 2002 and Sandy Abney currently serves as the Head Strength and Conditioning coach for Rowing (women’s varsity crew and women’s novice crew) and Women’s Swimming. The success that all of these sports programs have had has a base that started in the weight room. An effective strength and conditioning program is an essential component of the preparation of any athlete. The core science (sports science) underpinning strength and conditioning techniques is the key training methodologies, including training for strength, speed, endurance, agility, flexibility as well as plyometrics. Regardless of the sport, training techniques today have evolved from the training field to the laboratory. The Human Performance Laboratory at the University of Texas investigates the physiological factors that regulate exercise performance. We at Texas know that champions are not born but made. Each athlete is a specimen that in order to bring out the best in that athlete, needs to be observed to identify his/her strengths and weaknesses. Sports require many different tasks or abilities to perform movements effectively. A few of those abilities include strength, power, balance, flexibility, and agility. 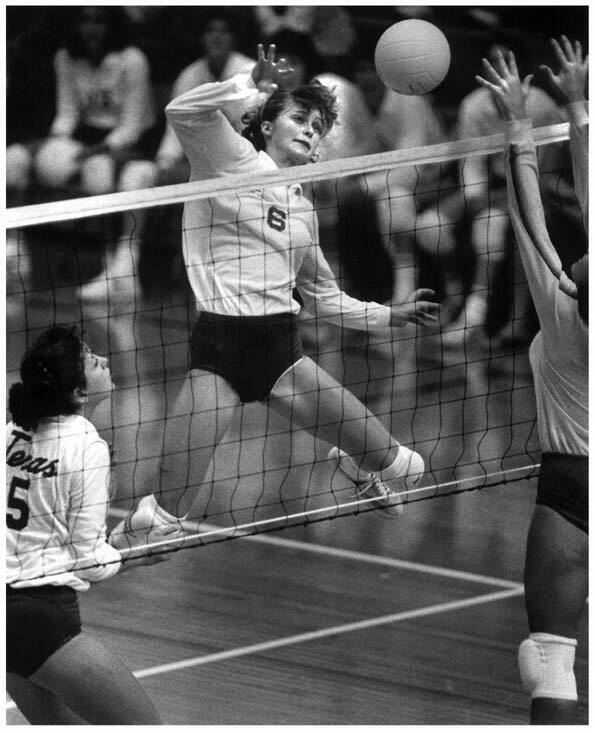 For volleyball players there is a transfer of the strength & power a player builds in the weight room to increased vertical jump, increased serve speed, better lateral movement and improved overall athleticism. Volleyball is a physically demanding sport, requiring strength, power, agility, and speed. Coach Jerritt Elliott's team never starts a season under prepared, which in over his 15 years as Texas’s volley coach has resulted in top 10 rankings the past 10 seasons, 10-consecutive trips to the NCAA Regional finals, the 2012 National Championship. Donnie Maib, the team’s strength coach, has a long history of seamlessly showing the parallels between sports science and athletic performance to teams that he coaches. This has obviously translated into the success that the woman’s volleyball team has year after year. “The Texas Athletics Performance Nutrition staff is passionate about educating and empowering student-athletes to improve performance and overall health through proper fueling techniques.” According to the university’s website, the nutrition staff ensures that athletes are making the right nutritional choices by providing individual or team consultations on proper nutrition; cooking demonstrations; and grocery store tours. In order to put the best product on the field or court, proper fueling of the body is essential. In addition to fueling the body, the nutrition staff coordinates a testing of body composition testing via DEXA. DEXA is short for dual-energy x-ray absorptiometry and is considered the gold standard for measuring body composition. The Fitness Institute at Texas explains that an athlete will lie down on an open “table” while their body is scanned. DEXA measures the fat, lean, bone mineral mass and %body fat for the whole body and regionally for your arms, legs, and trunk. The information derived from this test will assist the strength coach in developing a program to increase the lean mass (muscle) of an athlete. Increased lean mass, less body fat builds champions. The ever changing evolution of the human body will forever feed the need for better sports science and human performance. Highly driven athletes, along with their highly driven coaches are always striving for the next level and the means to reach that level. It’s an incorporated effort by many people and facilities, and fortunately the University of Texas athletes have the facilities to achieve athletic greatness. The University of Texas kinesiology department has assembled an incredible staff that educates and trains future sport scientist. Dr. Lawrence Abraham focuses on biomechanic analysis and instruction, and neurological correlation to fine motor skills; Dr. Edward Coyle investigates metabolic and cardiovascular factors that limit exercise performance; Dr. John Bartholomew researches the effect of exercise on mental health to improve mood and reduce stress; and Dr. Roger Farrar studies muscle physiology and adaptability across the life span in response to exercise training and injury. These are only a few of the many brilliant minds at Texas who have devoted their life to advancing the performance of the human body on the athletic field. The nature of their work is far too complex for most of society to understand but knowing that on Saturday afternoons in the fall the product that you witness on the gridiron is the result of the lifeworks of the fore mentioned professors. The nature of their research is far more advanced than what is reported here, but it is common knowledge that the University of Texas recruits the best at all levels of education and research. Because of this, the goal every day is to build champions at home and beyond. As we move into the future, athletes at Texas, whether we are talking about baseball, softball, volleyball or football to name a few, the number one factor in sports is talent. Whether you have it in your genes or not. What if science might help in telling you what kind of sports should you try based on your genes? What if they tell you how you should your change your work-outs or your overall training in order to prevent injury? Or what kind of nutritional demands do you have? The future knows what we currently do not. A well-composed diet plan is crucial for athletes. As we are all genetically different, our diet should be personalized. The new field in dietetics, nutrigenomics aims to do exactly that. Beyond nutrigenomics there is a gazillion of healthcare wearables and sensors which might aid an athletes training, keep him/her healthy while bring out the best in them. Such devices let us measure data about our health, as well as receive immediate feedback about how we are performing. Beyond gadgets, imagine chips and clothing measuring vital signs and devices actively boosting performance! Many athletes now wear special shirts that measure their vital signs during practice or even games. Technology boosting performance training is the future. Texas is, and always has been a leader in sports related research. In today’s competitive world of sports, strength training can start at a very young age. Long before kids get into high school parents are getting ahead of the game, much to the author’s dismay. At what age should kid have a strength coach? 8, 9, 10 years old? 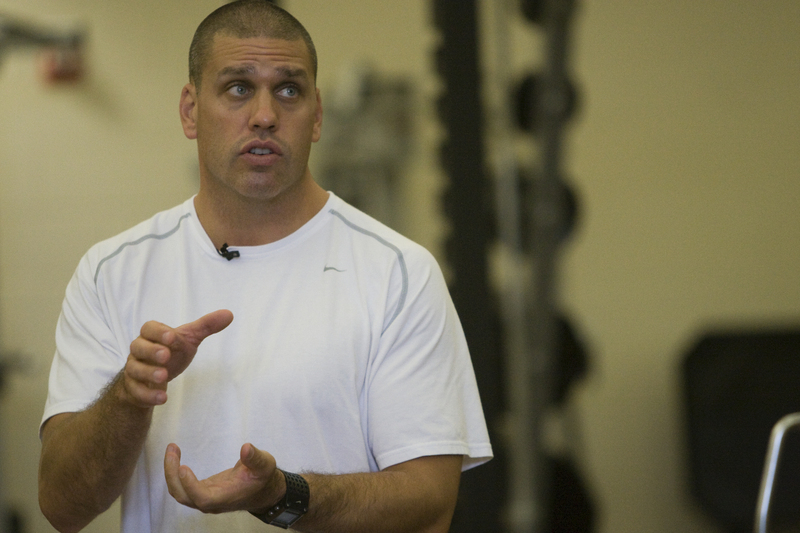 During my years as a strength coach, I would hold summer camps for students. I would have 11-yearolds accompany their parents into the gym at 5:30 a.m. A few of these kids were highly motivated and never missed a day. They were never board or disinterested in the programs and the results showed in their level of play. Youth sports today are not just winter, spring and fall school programs, but select teams and club teams that allows kids to specialize in one sport year-round, and a part of this specializing includes sport specific strength training. Future strength training practices will only get better and be able to produce a much faster, stronger, and more agile athlete. Who knows how far it will go? Where will it all stop? Is there a stopping point? With the unbelievable advances that we have made since the days of Ralph Hammond, Longhorn fans can look forward to seeing better athletes and many more championships in all sports. What I do know, is that here at Texas, we do not recognize a ceiling on what our athletes can achieve. Hook’em.